Businesses today want to continually leverage innovations delivered by SAP at the lowest possible risk. The IT department‘s mission is to maintain and enhance the SAP software used to boost the efficiency and be the differentiator for the business. Need to change your landscape could be driven both from business as well as technical standpoint. IT department is expected to respond swiftly to help their organization adopt innovations as quickly as possible. It isn’t easy…. SAP Solution Manager offers the next generation customer experience for maintaining your landscape through the SAP cloud-based Maintenance Planner. The Maintenance Planner enables easy and efficient planning of all changes in your SAP system landscape. Maintenance Planner is compatible with SAP Solution Manager 7.1 and SAP Solution Manager 7.2. Through Maintenance Planner, SAP Solution Manager drives simplicity for maintaining your system landscape, being perfect for new and upcoming SAP Solutions such as SAP S/4HANA. This simplification is automatically extended to all existing products. SAP Solution Manager continues to serve as the single platform for the delivery of SAP Service and Support including governance and documentation of the entire maintenance process. Maintenance Optimizer is no longer supported. Maintenance Planner is the successor of Maintenance Optimizer. Read more about Maintenance Optimizer sunset. In SAP Solution Manager 7.1, Maintenance Optimizer has retired since January 9, 2017. SEA (Scope and Effort Analyzer) will continue to be supported. For SAP Solution Manager 7.01 SP 23 or above, Maintenance Planner is supported, provided, you have installed SAP Note 1646604. Figure 1: Home screen of the Maintenance Planner providing access to the systems overview, existing tracks, transactions, and planning of new systems. is a solution hosted by SAP. simplifies the landscape maintenance process to update, upgrade and install new systems with much greater ease and efficiency. integrates correction of landscape data with the maintenance process in a dialog driven process. consolidates definition of maintenance dependencies. streamlines new system installations by eliminating superfluous activities. prevents inconsistency across systems in a multiple tier SAP customer landscape. The Maintenance Planner is the strategic tool that enables easy and efficient planning of all changes in your IT landscape. 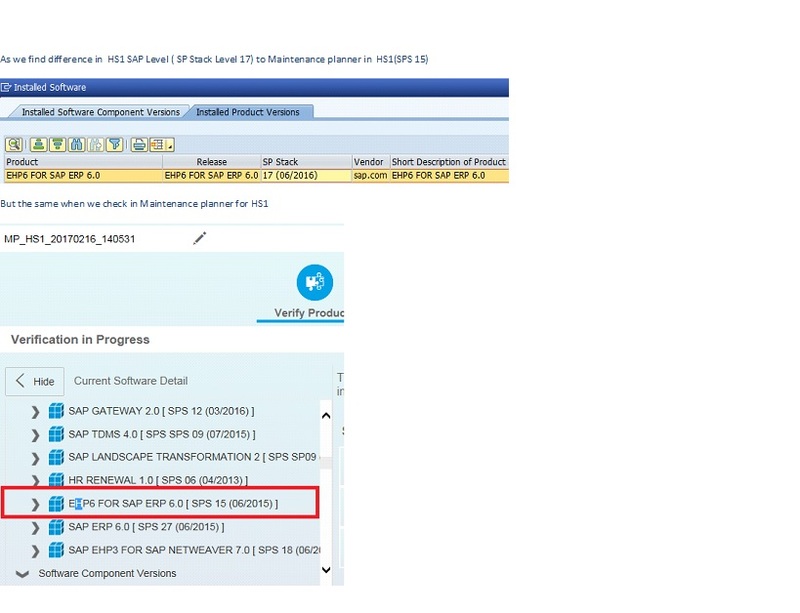 The Maintenance Planner supports SAP Solution Manager 7.1 and is mandatory for SAP Solution Manager 7.2 and for all calculations regarding SAP S/4HANA and SAP NetWeaver 7.5+. Being integrated with SAP Fiori Apps Reference Library, it is the planning tool for this area. Maintenance Planner simplifies the complex process of modeling maintenance dependencies (for example the version dependencies between a portal and an ERP system in a self-service scenario) through an intuitive procedure. Currently, maintenance planning is focusing on individual system maintenance, which often requires multiple planning activities for a complete track. Maintenance planner offers planning for complete system tracks (like DEV – QAS – PRD) to lower overall planning efforts. Incorrect system information about installed products has been a frequent source of error while planning maintenance activities. Maintenance Planner validates the system information as a first step in the planning process. It guides you through a dialog based process to correct the system information as part of the maintenance activity if necessary. Maintenance Planner significantly simplifies the installation process by eliminating the steps of system registration and a separate system update planning during installation. With Maintenance Planner, the target state of a system can be planned and downloaded in one step so that the overall installation process will be simplified, accelerated and less error-prone. The Maintenance Planner is hosted by SAP, it only requires a browser to access the tool. Figure 3 – the maintenance process with the Maintenance Planner: System data is uploaded to the Customer Profile via SLD and LMDB; in the Maintenance Planner changes are defined and stack.xml and download basket are prepared. Consuming tools are Software Provisioning Manager Software (SWPM), Update Manager (SUM). etc. and the Scope & Effort Analyzer as of SAP Solution Manager 7.2 consume maintenance transactions from the Maintenance Planner. Ensure that you have an s-user for the SAP Service Marketplace (SMP). To ensure availability of your company’s landscape data in Maintenance Planner, follow the steps described in the blog Maintenance Planner – Prerequisites and Initial Setup. Access the Maintenance Planner with your s-user. A User Guide can be accessed from the home screen of Maintenance Planner. Please refer SAP Note 2174410 for the list of Maintenance Planner limitations. 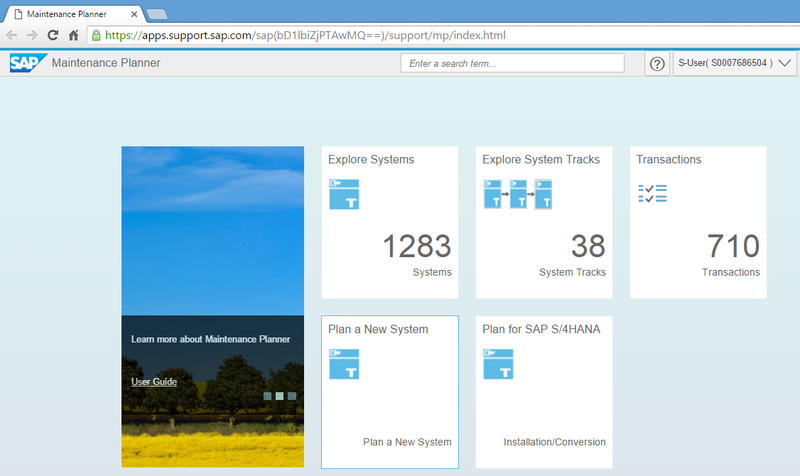 To learn about SAP Fiori installation with Maintenance Planner see blog and video of SAP Fiori Apps Reference Library Integration with the Maintenance Planner . Propose new features or suggest enhancements to existing features by collaborating on ideas for new features in SAP Idea Place, the public channel to participate in innovation at SAP. Maintenance Planner belongs to the idea session Software Logistics, category: Maintenance and upgrade management. Submit new ideas, vote for existing ideas and connect directly with the team at SAP! Thanks for reaching out, component for Maintenance Planner is BC-UPG-LP. According to the following doc, there is a new component (BC-UPG-MP) for customers to select when they create incidents regarding Maintenance Planner. Should the information here not help, there is a new component to create incidents for problems related to the Maintenance Planner: BC-UPG-MP. Thanks for the useful information. We use maintenance optimizer to approve downloads in download basket. Will it be done via maintenance planner going forward. In SP14 of Solution Manager 7.1, files in download basket no longer required to be aproved. The confirm button has altogether been removed from UI. Would SAP take care of the planned maintenance of our systems when we opt for this service? It was great getting in touch with Hengevoss and Mitual at SAPTechED Barcelona, also attended a hands on. Gettting to a real scenario now, I am trying to use maintenance planner, to install Release 608 SAP_HR and EA-HR SP21, however the MP shows that the latest EA-HR 607 44/SAP HR 6.04 93, when i am already on 608, that is strange! Excellent idea of a handy tool for system administrators. Anyway, I need to set up a new AAEX (Advanced Adapter Engine Extended), which a pure java integration netweaver. Where do I find this option? Tool only let me pick Application Server ABAP, BI Conent, Trex and Business Inteligence. Thanks. I have two questions regarding MP. 2. How can I delete a Transaction? 2) In the current functionality deletion of a Transaction is not supported, this feature is under development, I will keep you posted. what will happen to the SLM download feature when MOPZ is replaced in Solman 7.2? It would be nice download manager and SUM could be integrated into one tool. Hello Priti, this is curious, but after having created and saved a track, I cannot see the track at all when I go back to the maintenance planner homepage. Am I an isolated case? After saving the track you also need to verify & activate it so that it is persisted for later use. After saving, you will find that the Verfiy button on the maintenance cycle has turned blue, click the verify button and follow the guided procedure to verify & activate the track. Hi Priti, thanks for your reply and thanks for your instructions! Thanks for the feedback, currently only ABAP installation is supported. However, there are plans to gradually extend the coverage also to JAVA. Please stay tuned for more updates in the coming months. From which version of NetWeaver onwards Maintenance planner is mandatory ? As mentioned in MP user guide, which backgound job in SAP Solution Manager is used for periodic update landscape data? Please note that the LMDB FAQ moved from http://scn.sap.com/docs/DOC-31457 to https://wiki.scn.sap.com/wiki/x/1EW7Gg. my SID is not acceptable, any idea how i have solve this error. there seems to be an issue with HR packages: although I select all available HR packages to be added (HRR2), they are not included in the stack file. in case of problems, please open an incident – component is: BC-UPG-MP. After creating dependency b/w systems, does MP provides upgrade level information for depend systems or we need Upgrade dependency analyser to identify it. I am having trouble with the following scenario and wanted to know how to get this accomplished using the Maintenance Planner. I am currently on a JAVA only Portal 7.5 SP04 Patch 0. I want to select all the Java Patches for the current base system. The Maintenance Planner selects no Java Patches even though I select the Add Java Patches button. There is no files to select. How do you recommend I get this accomplished without having to manually select all patches. transaction id for further analysis. Did you get your issue resolved ? I am also facing the same problem while add Java patches option. Thanks for reaching out, we need to take a deeper look at the issue. Could you please raise an incident – component is: BC-UPG-MP. Please provide transaction id and steps to replicate the issue. i’m trying to plan an installation of NW 7.51 for S4HANA OP 1610 Adobe Document Service and get exactly the same error as Sankara describes. is it general problem now with MP? if yes, do you have any solutions which you could post hier? This is not a known issue, could you please provide transaction id and steps to replicate the issue. When selecting files, why do all nodes expand and not just the selected node? For example, when I click to expand the DB2/390 node, all DB nodes at that level expand and the list will scroll to the first expanded node in the list, rather than the DB2/390 node. This seems to be bad user experience and can cause inadvertent selection of wrong components. Does anyone else have this browser experience? I have tested in IE, Edge, Chrome and FF. They all exhibit same behavior. We are aware of this usability issue and we are working on providing a fix. I will inform you once fix is available. Thanks for your patience, Issue is fixed. We are in process of upgrading our system from ECC 5 to ECC 6 EHP7 and using maintenance planner but unfortuantely facing issue after selecting EHP7 files, if we click next we are getting error message “No kernal files available for selected target. Click confirm to proceed.” as the relevant packages are not selecting. Please note that LMDB /SLD are in sync with proper details on portal and solman. We have raised the incident but no response. Also since we are on ECC 5 there is no option to download system xml info. Could you please let me know the incident number. Thanks for reaching out, I would need more details to answer your query. What exactly do you mean by Maintenance Planner not choosing upgrade files? Could please let me know the exact steps. I am referring all of the DVDs needed for an upgrade and/or installation in addition to the SCA and kernel files. Since we enter the software version and support pack to which we want to upgrade, I thought the Maintenance Planner may include these. I downloaded these files separately. I am upgrading an SAP NetWeaver Portal system, so it is java only – I am not sure if that makes a difference when using the Maintenance Planner or not. DVDs for installations etc ..needs to be downloaded separately. Thanks for the feedback. You can manually upload the landscape data from SAP Solution Manager to the Maintenance Planner, you can go to LMDB and click the Upload to SAP Support Portal button. Once this is done, updated system data will be immediately available on Maintenance Planner. SPS displayed is estimated based on software installed on the technical system, if you need more details you could open a BCP incident. However, you can go ahead and generate stack xml, if you select target SPS higher then 17 it will work fine. I am trying to generate a stack XML for the Installation of SAP Assurance and Compliance software Add-on 1.1 to the ECC System which is running on ABAP NW 7.4. While calculating the stack I am getting the below message. Request your help on this. Please raise ticket on component BC-UPG-MP. It helps us to analyse issues more effectively. I have already raised an OSS message to BC-UPG-MP and it is currently in Processing with the component BC-UPG-ADDON. Thank you. I am experiencing the same issue as explained by Kathy Moreillon. Not sure if you have answered already. When I select a change ‘plan’ the application is supposed to give the options such as support packs/kernel etc. I could see only EHP. Isn’t the intention for any patch upgrade ? If you are referring to DVDs for installations etc ..currently DVDs needs to be downloaded separately. I have opened a message with component BC-UPG-MP last week, but not resolved yet. Do you have any idea how to correct this? Can this be used to plan/execute system refreshes? We need regular refreshes of our Training Landscape from Production. Can this tool help simplify the process? Maintenance Planner is intended to support, Software maintenance related activities. System refresh is not supported in Maintenance Planner. SAP Landscape Management (LaMa) automates SAP system operations including system refresh, you may want to check if it fits your requirements. I´m also facing problem to upgrade my ECC 6 EHP3 to EHP8/5/3 it keeps giving me error No kernel files available for selected target. Click confirm to proceed when I want to select target. There is anyone who know the solution for this issue? do you know if there is a way to keep the Maintenance planner from automatically selecting certain components to be installed and updated to the XML file? We are trying to install the GRC 10.1 plug-in so that we can provision to a system but we do not want to go through a significant upgrade of core stack dependent files as this would require significant regression testing in the environment. I can uncheck those in the “Select Files for Download” screen but then I get a message stating they will be automatically added back. During the final queue check Maintenance Planner reselects and automatically adds the files which are required for stack compatibility. This is by design to ensure consistency of the stack. We are working on a new feature to display which files are reselected. In case there is a stack dependency Maintenance Planner will add those files but with this planned feature it will be transparent which files/components are added. 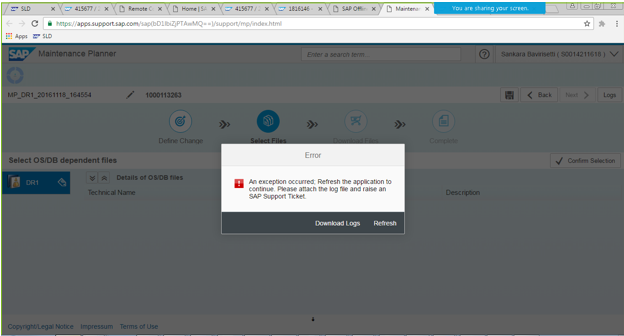 1- my client using old solution manger (7.01 SP28) and I am trying to upgrade it to 7.2 but system landscape data is not uploaded to SAP MP, I searched in internet and all advice to apply SAP note 2408911, I applied it but still I don’t know how to upload solution manager data to SAP MP, could you please guide me ? 2- my second question is I start process of planning new IDES installation in SAP MP but I didn’t find the option of IDES in the list of products, how can I plan it ?